Finally Rangpur Riders have tested the title. After a long time they have made it to the trophy. BPL is one of the most prestigious T20 league in the World nowadays and after IPL and Big Bash League, it is regarded as the most popular competition. Already fifth season of the tournament has gone successfully and total three teams have tested the trophy of BPL. Now, in fifth season final, Rangpur Riders won 5th BPL title by beating the defending champion Dhaka Dynamites. Team Dhaka was lost by 57 runs in final. Yesterday night the fifth season of BPL final was grounded at Sher-e-Bangla National Cricket Stadium, Dhaka. Earlier, Dhaka Dynamites won the toss and decided to field first. The final match was staged in 12th December, 2017 where Rangpur Riders started their innings with Chris Gayle and Charles. 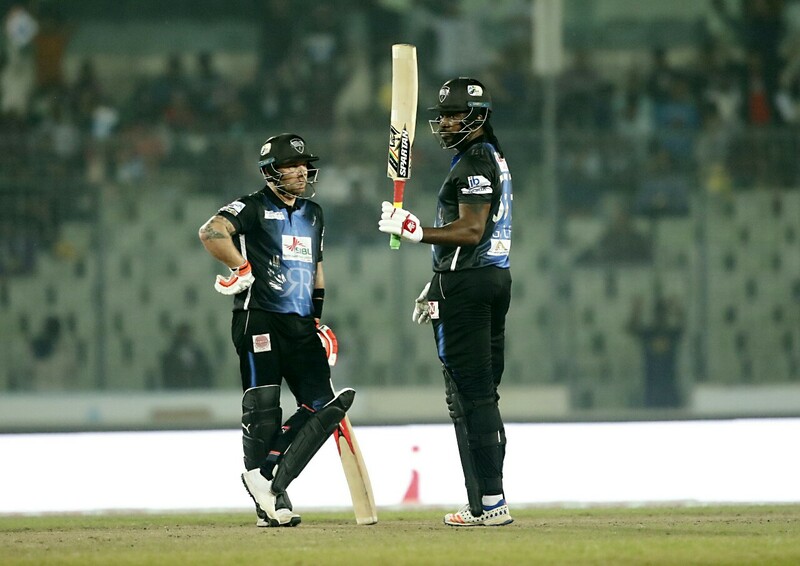 Charles played well and made a century in his last match against Comilla Victorians. But in final, he was out by scoring only 3 runs. Later, Gayle and McCullum made a great partnership and finished the innings successfully. With their long and destructive partnership, Rangpur Riders scored 206 runs in selected 20 overs. Chris Gayle made a century out their and also made a record of highest sixes. In just 69 balls, he scored 146 runs so far. He made eighteen 6’s and five 4’s in his innings. On the other hand, his partner McCullum scored a fifty as well. He made four 4’s and three 6’s and finished the innings with 51 runs. Shakib Al Hasan just took one wicket for Dhaka Dynamites. Dhaka Dynamites has no other way but to chase 206 runs milestone in final. They started their chasing innings with Mehedi Maruf and Lewis. But in 0 run, their opener Mehedi Maruf was gone. And in 1 run, Denly was gone as well. Both players were out before opening run account. Lewis played a bit and scored just 15 runs. Skipper Shakib fought alone and scored 26 runs in 16 balls. Just Jahurul Islam made a good score. He scored fifty runs in 38 balls. Finally, Dhaka Dynamites did able to play full 20 overs. In the meantime, they lost 9 wickets and scored 149 runs. For Riders, Udana, Sohag Gazi and Nazmul Islam took two wickets each. Due to a brilliant century, Chris Gayle was awarded as the player of the match and also due to be the most scorer in 5th season of BPL, he was also declared as the player of the tournament.